Take that dirt or gravel detour with confidence on the Talus 2—our upright next level mountain bike designed for paved paths, gravel and dirt at a great price. If you crave stability and like the look and upright feel of a mountain bike, but still like to hit the road, consider the Talus 2. At home on dirt, gravel, and pavement, this bike will keep your adventure going when you decide it’s time to head off road and explore the path less travelled. The lighter weight alloy frame provides a comfortable riding position for your neck and lower back, and being upright gives you a better vantage point for spotting any obstacles in your path. Shimano trigger shifters offer you 24 different gears to get you through whatever may cross your path without having to move your hands off the grips. The SR Suntour suspension fork and Raleigh Mountain Plush Saddle ensure that your ride is a comfy one. The large 27.5" wheels and wide 2" tires help you stay nimble but stable over bumps. And bonus rack and fender mounts allow you haul more gear and add fenders to ride in inclement weather and stay (relatively) clean. I am very happy with this bike after 4 months of riding. I am using it mostly on paved county roads, some gravel, and some city streets, rolling hills, and pulling a bike trailer and have had no problems. Good stopping power with the brakes, precise shifting, etc. Really, everything is performing as expected. It took me some time to get used to the 27.5" wheels and "newer geometry" of mountain bikes (compared to the M40). This showed mostly in getting the seat-post at the right height so pedaling feels natural. Also, I have no frame of reference of what a bike with front suspension is supposed to feel like, but the gravel roads in my area are pretty choppy in places and the fork seems to deaden the washboards well. I'm going to get it tuned this weekend for the GASP ride in a couple weeks. Again, Great Bikes, Great Company, and the Talus 2 is no exception. I had a Raleigh M40 that I bought back in college (2000). Cleaning it up a couple weeks ago(2017), I found a crack in the headtube. I still had the receipt in my Owner's Manual and contacted the company not expecting much. 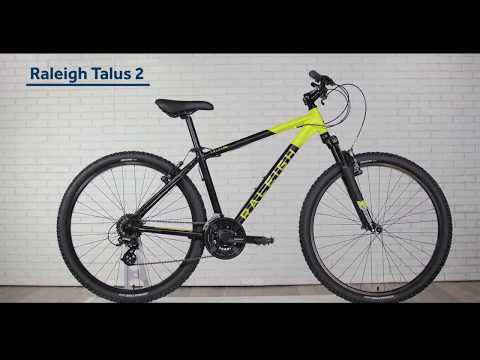 After filling out their warranty claim form and sending them a couple pictures of the bike, they offered replacing it with the Talus 2 for no charge. I was and am amazed and very grateful. The bike was at my door the next week. It wasn't quite as "Ready to Ride" as they claim, but pretty close. I had it assembled in 30 minutes, but the front wheel was a little out of balance and the brakes and shifters needed some adjusting. The bike looks great though and I'll post an update after I have a chance to ride it and get it tuned right. All and all I can't state enough how amazed I am that the company honored the warranty on a 17 year old bike. My kids will definitely be getting Raleigh's when they are old enough to start riding.